A good way to start off March ... at least through my eyes! It's not even a great shot but any day that you can cross paths with the World's largest falcon ... I'll take that as a good day! 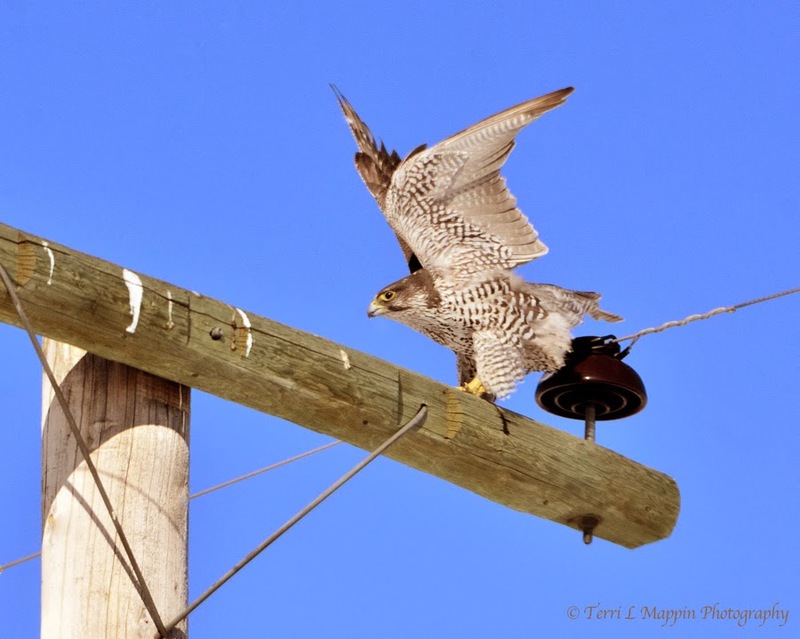 Yes, this was an O M G snapshot of a Gyrfalcon (Falco rusticolus). Not only the World's largest falcon but probably one of the top avian hunters around! What would be their choice of meal: pigeon, duck and other succulent birds! Aaaaah ... to see one in action! I might have to be better prepared and see if I can cross paths with this magnificent raptor again before Spring arrives! Oh, what a catch! They are so gorgeous! What timing you have! A great way indeed to start the month! I am so ready for spring migration!!! gorgeous, plus you have a blue sky! Boo Hoo ... our blue sky is gone and has been replaced with grey, overcast drab! Wow! I think it is an amazing shot. Awesome !! Cheers Sally! I have a weakness for raptors and I was pretty stoked that I saw this amazing falcon! Thank you Pam! I am looking forward to the Spring migration and the return of our song birds! Other than the chirps from sparrows, the caws from Magpies and the coos from pigeons ... winter is rather quiet.